Commuters are being urged to speak out against errant minibus drivers. 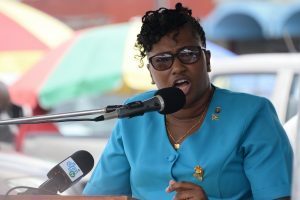 The call was made by Minister within the Ministry of Public Infrastructure (MPI), Annette Ferguson at a Road Safety Education awareness village hosted at the Stabroek Market Square today. At the event to observe the end of road safety month, Minister Ferguson said despite continuous awareness campaigns on road safety, road users particularly minibus drivers are still in disciplined when utilising the roads. “They (minibus drivers) do not observe the rules of the road, they continue to double up the minibuses, they continue triple up the minibuses. These are things that I observe on a daily basis when using the road, and we have the users of these transportation services, that do not speak out, they remain silent”, she was quoted as saying by government’s Department of Public Information. The minister opined that remaining silent has contributed to the many road fatalities. She noted that the government cannot afford to lose valuable human resources because of the negligence of others. Minister Ferguson disclosed that for the year the MPI has spent millions of dollars to implement several road safety measures. These include road repairs; road surface markings; placing speed bumps and street signs; outfitting main access roads with street lights and traffic lights, sidewalks and the construction of pedestrian overhead crossings. It was also highlighted that the ministry will be conducting feasibility studies on the East Coast, West Coast and West Bank of Demerara to identify strategic points where more pedestrian overhead passes can be placed. “We recognise that we have to protect the lives of our pedestrians, but the only way that this can be achieved is by ensuring the culture and the attitude of our road users changes. So, it must begin with us” the Minister explained. Traffic Chief, Dion Moore cited statistics which indicate there have been 84 fatal accidents resulting in 95 deaths against 104 accidents with 114 deaths for the corresponding period in 2016. Moore said that while there is a significant decrease, more road users need to speak out against reckless driving, thereby ensuring less needless deaths. “If we need our roads to be safe, then we must change our attitude when we use the road. Many time we see other persons doing things that are not in keeping with road safety practices, but what we do? We sit, relax or we go about our journey without saying a word. If we speak out, we can make a difference,” Moore said. 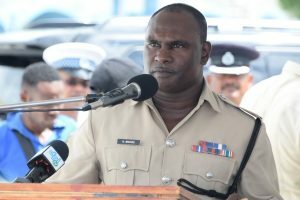 The traffic chief revealed that with the department’s recent receipt of four new vehicles the presence of traffic officers at nights will be further enhanced. Moore reminded persons to use the five Cs – care, courtesy, caution, consideration and common sense – when using the roadways.